Very few things can stir the feelings in a hunter’s heart like a fine set of well-polished and symmetrical antlers. These bony protrusions mesmerize and amaze us. They are the things our dreams are made of the night before opening day. On our trophy wall they symbolize our appreciation of their design and give us a status among our peers as to our abilities and wisdom in the outdoors. But long before antlers are our trophy remnant, they serve a greater purpose to the animal that nurtures and relies on them as a means of establishing his dominance in a herd. With them he has the potential to be the herd boss, being given breeding right over many smaller bucks by the females of the group. His selection of rub trees and the length of time he spends honing the antlers show how serious these weapons are to his survival. Antlers are a very interesting topic of discussion. I am amazed with every rack I see regardless of how well it scores or how poor of a job may have been done attaching them to a board or body form. The fact that these bones can grow from nothing to over one hundred inches of mass in such a short duration of time and be as symmetrical as they are is nothing short of a miracle in my book. But do we really understand how antlers come to be? To truly gain an appreciation of this process and an understanding of antler significance to the cycle of life for Deer, its best we start at the beginning. On the head of a male deer are two short skull protrusions called pedicles. These pedicles start just under the knobby ring that surrounds the base of the antler and continue down to the skull. From this pedicle grows the sheathed antler, starting in early to mid spring. This process is, for a lack of better words, a piling up of blood capillaries, that, based on the animals genetics and other environmental factors will follow a kind of road map as they grown from the pedicles. The exact amount of antler mass that will be created is impacted greatly by many different factors. Available food is one of the major contributors. Food energy is what makes the extra available mass possible. Thus, only food energy that surpasses the dietary needs of the animal will be available to become additional mass. Another factor that can greatly influence how much energy can be allocated to mass is competition. The greater the competition, the more body mass the animal will need to be competitive. In very fit bucks, those blocky, strong necks and chiseled muscle masses take a great deal of food energy to maintain. That food energy is then unavailable to become antler mass. Other considerations are climate and terrain. Exactly how much energy will be needed to layer in fat reserves for cold climates or to cross a much more aggressive terrain daily will play on energy reserves. There is also the predation factor to consider. There is an amount of energy given to stress from predators or incidental human interaction and predation. All of these things cumulate with the genetic factor that all animals are dealt, making it clear that antler growth is much more than a roll of the dice. As these antlers begin their assent from the pedicles, a sheath of scabbing type material referred to by most as velvet, protects them. This velvet serves a very important role in protecting the growing and exposed bone from parasites as well as from drying too soon. The antlers at this stage of growth are very sensitive and simply bumping them can be quite painful for the animal. Bugs and other parasites that gather around the growing antlers become quite bothersome and the animal will actually take measures to minimize this annoyance. Another antler growing consideration, at this stage, is how heavy they are during mid summer. These blood-engorged antlers can weigh almost double what they do when they are fully dried and cast or removed. With this additional weight to consider, animal movement may be minimized at this key time. Now in the midst of the growth cycle, certain daily travel patterns may be altered or new ones start to materialize. Big bucks may spend more time in open area’s where available wind can help keep bugs and fly’s away from the antlers. These open areas also provide little obstacle for maneuvering the very sensitive rack through things like brush and forests. 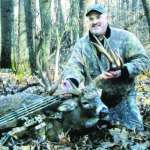 This is a time of much higher visibility and often what prompts many of the conversations where people report seeing big bucks all summer and then by fall, they are gone. As summer passes the antlers reach a certain stopping point in the growth cycle. At this point, they begin to harden and dry. The urge to remove the velvet becomes a priority, as the pecking order starts to become more defined. This is the equivalent of a last lap sprint. These animals have now figured out how dominant they will potentially be and begin to capitalize on it by honing and polishing their antlers. Some types of tree sap will have a rich and darkening effect on the antlers where others will cause a whiter and more polished look. This polishing is a key element to the breeding acceptance they may get and the first warning to other bucks that these antlers are what they will need to contend with. At this stage, the antler is fully-grown, scraped, polished and ready for use. The damage or inadequacies of the antler are fully visible. These imperfections may have been caused by things like a sever bump to a growing tine, or a non fatal run in with an automobile causing injury to animal. This type of injury can produce an antler deformation of the opposing side of the rack from the injured side of the body. None the less, the antlers are done growing at this point, and are now a weapon. This will be on the visual value alone, a step toward establishing dominance in the herd. Female deer will attempt to deny inferior animals the opportunity to breed them for as long as they can, holding out for the bigger bucks to sire the young. Many animals that are harvested during these velvet and pre-rut stages have not had the opportunity to pass their superior genetics to the breeding cross section. This is in fact the higher profile poaching times of year. If the buck has made it this far, he will begin to perfect his daytime disappearing as fall approaches. In reality, it’s not much of a mystery at all. There is an extremely high amount of energy used during breeding and the bucks adapt to that fact by becoming more nocturnal. There is much less activity at night and it allows for better opportunities to breed and move from cover type to cover type with a minimal amount of energy. Thus, the illusion of disappearing bucks. If the animal makes it through the hunting season and into the winter months, the antlers begin to dry even further, or rot on the vine, so to speak. At this point, just under the knobby ring at the base of the skull, a white circle begins to appear around the circumference at the pedicle. This usually does not happen until later in December, but this is the point at which the antler will drop or remove itself from the pedicle and fall as a cast antler. Obviously again, the environmental factors are at work with much colder weather and bucks bedded longer can cause the antlers to be knocked off in the bed. Additionally, the heavier the antler, the sooner it will likely break free. Climatic stress and available food also determine the speed in which the new growth process will start. In some species it is almost immediately. I have witnessed, in January, animals with smaller racks still carrying their antlers and a mile away a bigger animal has the beginning of a new growth protruding. This is again an example of genetics at work. However, at this point the old antler is removed and the onset of the future antler waits. Rodents will eat the antler as sunlight and harsh weather conditions bleach it. This antler could be compared to future antlers the buck may carry, if found by a cast hunter. It is one of the best ways to determine what your herd has to offer in the post season, as it is a strong indication of the value of the available food in the area and genetics of that particular herd. On the forest floor lies the cast antler that served so many purposes and tells the tale of a year in the life of a buck. Every bend, knot, break, scrape, scratch and color blotch is part of the story.